Chinese bronze vessel known as the Rong gui (gui is a type of vessel). It’s housed in the British Museum and dates c. 1050-771 BC (early Western Zhou dynasty). 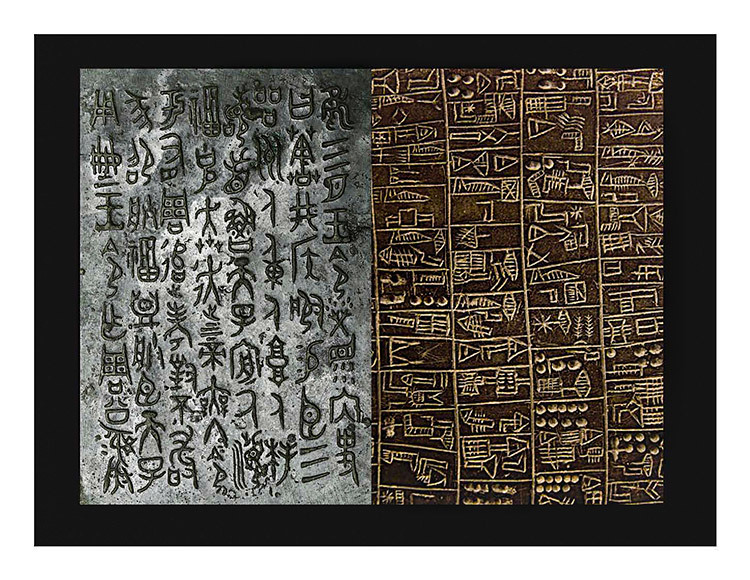 The piece on the right is a Sumerian black basalt tablet housed in our Oriental Institute; the text dates to the Early Dynastic period, c. 2500 BC. The script is cuneiform. The two pieces are similar in that both deal with land — the Rong gui is a land grant, the Sumerian one records the acquisition of multiple parcels of land through purchase. The two pieces reflect similar stages of paleographic development in their respective cultures: both were written sometime after writing was invented in each culture, but are early enough that some of the signs retain a level of iconicity, that is to say some look like their referents (the common term for this is ‘pictographic’).